6 Kms. from Bandikui railway station in Dausa District (62kms from Jaipur off Jaipur-Agra Highway) is Abhaneri-an ancient town best known nowadays for the 8th century stepwell and Harshat mata Temple.This ancient city is said to be the capital of Nikumbh Rajputs before they founded Alwar.Some 1000 years old this is one of the sites chosen for the rural tourism project by the Co-operative Department along with Bichoon( If successful this project will encompass about 26 villages in 15 districts).These villages will be known as Tourist Dhanis. At present only day tours are proposed.Tourists will be welcomed in the rajasthani village style and offered a glimpse in the day to day life of a rajasthani villager.Their food,games,dances and songs and customs and costumes all will be on display.Far from the Five star culture of the metros this will be a unique experience for the jaded tourist of today.They will also be given bullock cart or camel cart rides.Camel/Horse safaries and overnight stays will be on request. The main attraction of Abhaneri are Chand Baori and Harshat Mata Temple.Built by Raja Chand of Nikumbh Rajputs of Chauhan dynasty during 8th and 9th century. The temple,built in Mahameru style-situated on a double platform, was a shrine to the standing idol of Durga which was said to be stolen some time back.The local people have installed an idol of Goddess Laxmi.A three day annual fair is held in honour of Harshat Mata. 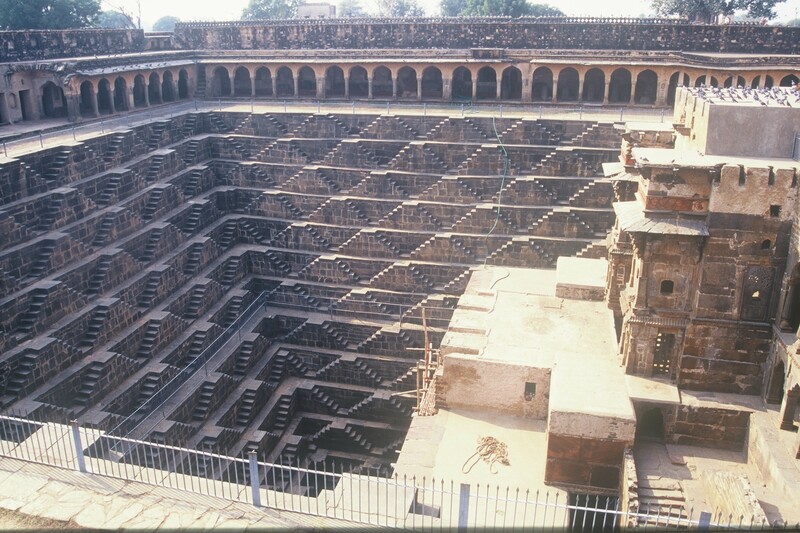 Chand Bori-earliest step wells of Rajasthan-is the most magnificent example of architecture of india.It is about 100 feet deep and square shaped.There is a veranda on all four sides.There are steps on three sides.About 3500 in number they are steep and narrow with 13 landings.These steps produce such a psychedelic effect that it is not possible to retrace you steps.People say that a tunnel connects Chand baori with the baori in Bhandarej village and further to Bubaniya Kund in Aluda. This entry was posted in Accomodation, Around Jaipur, Blogroll, City Life, Clubs, Comments, culture, Details, food, GuestHouse, Hotels, india, Jaipur, Museums, Photos, rajasthani, Shopping, Travel, Uncategorized and tagged Abhaneri, Agra, aluda, Around Jaipur, bandikui, bhandarej, bichoon, chand baori, co-operative, dausa, harshat mata mandir, india, rajasthan, stepwell, temple, tourist dhani. Bookmark the permalink.